I'm in deep mourning for my adult son, who died at the end of last year. 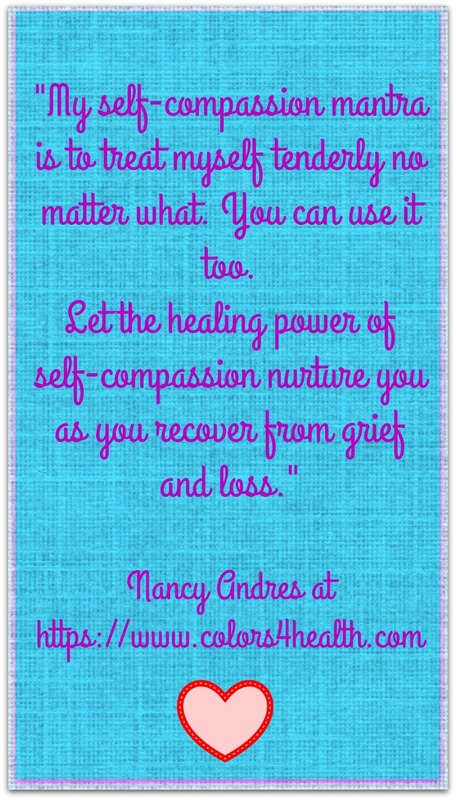 From time to time I go into denial, or may experience grief, anger, heartache, anxiety, acceptance, and self-compassion. This is Part 3 in my Healing Series. A myriad of feelings ebb and flow inside me, as I process my emotions. 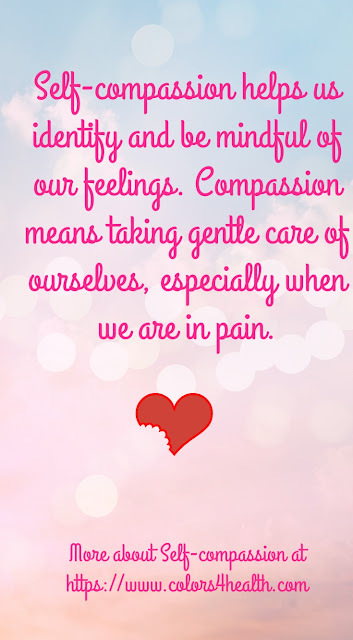 Healing and recovery through self-compassion is a post that appeared on this blog on 2/1/19. 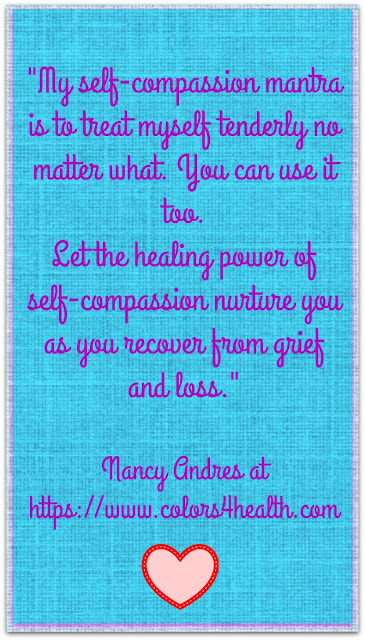 It is Part 2 of my Healing Series, and lists reasons why self-compassion is effective, even during challenging times. In Part 1 I share ways COLORS have supported me as I journey along (see link below). 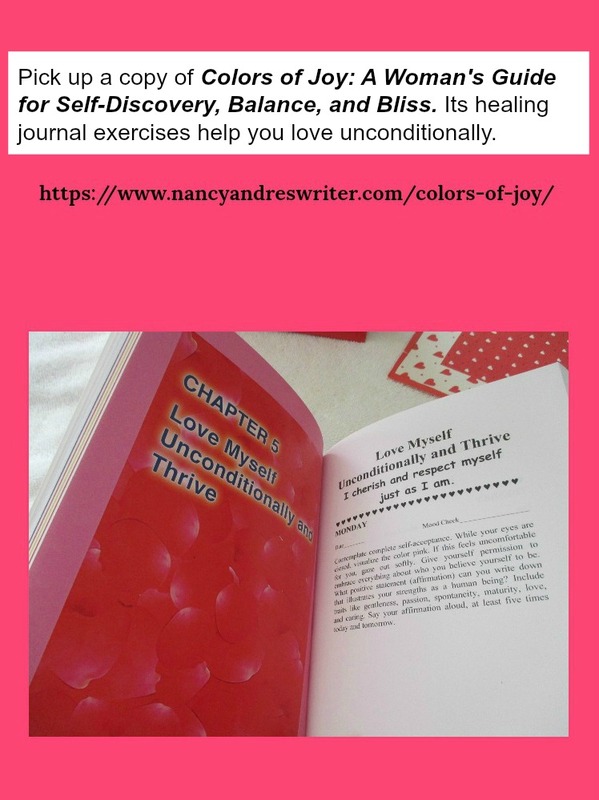 I discovered through personal experience and research conducted since 1997, when I became a health and lifestyle writer, that color vibrations bypass human reasoning to work at the cellular level. Colors are a conduit for positive energy shifts, and serve as a powerful path for healing and recovery. Specific colors encourage me make self-care a priority and treat myself with Tender Loving Care (TLC). Colors help me have the motivation to recite affirmations, journal write, and exercise. 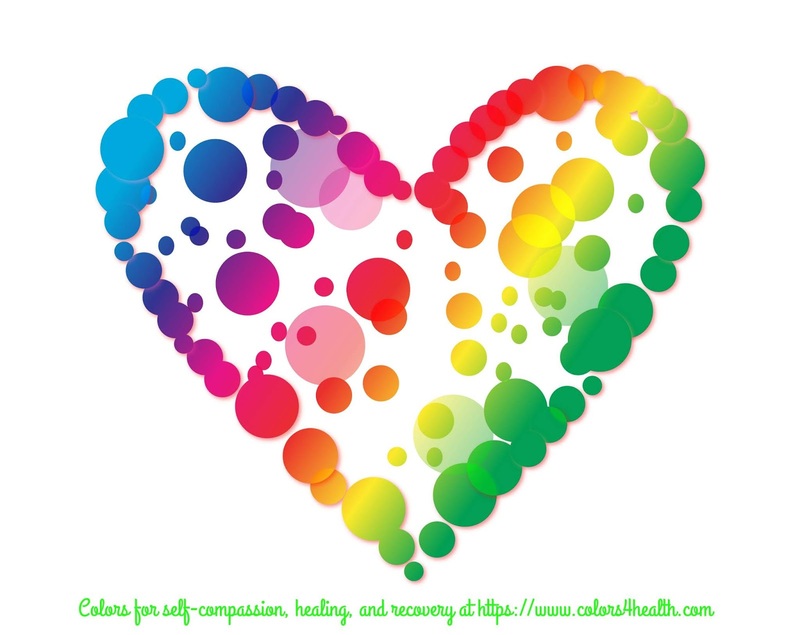 Learn how colors can create a sense of self-compassion for you too with tips below. 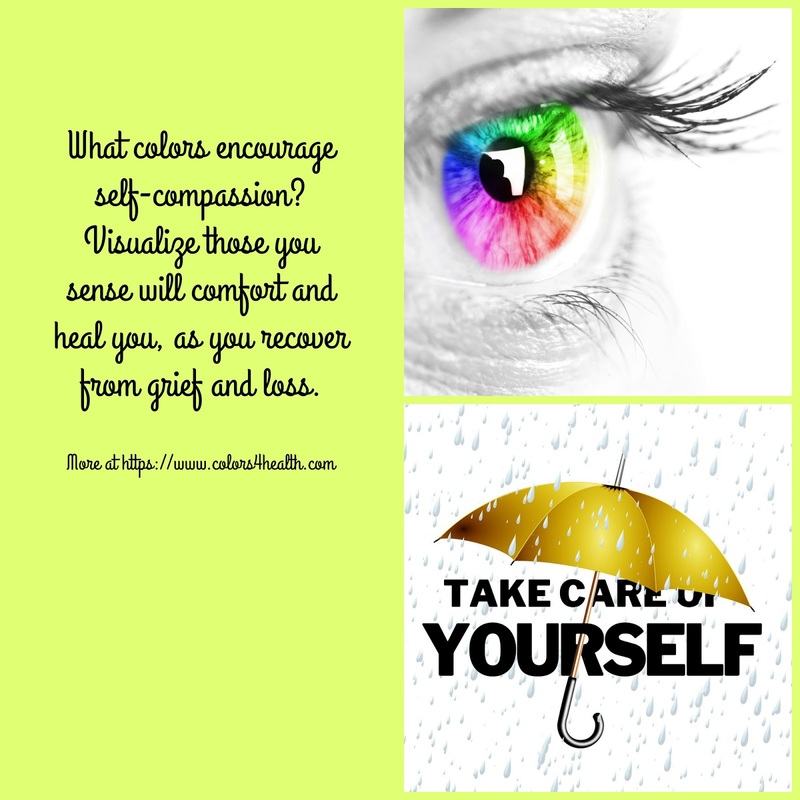 Now on to color characteristics and how they can nurture you. BLUE. Brings peace, relaxation, balance, calm, and tranquility. 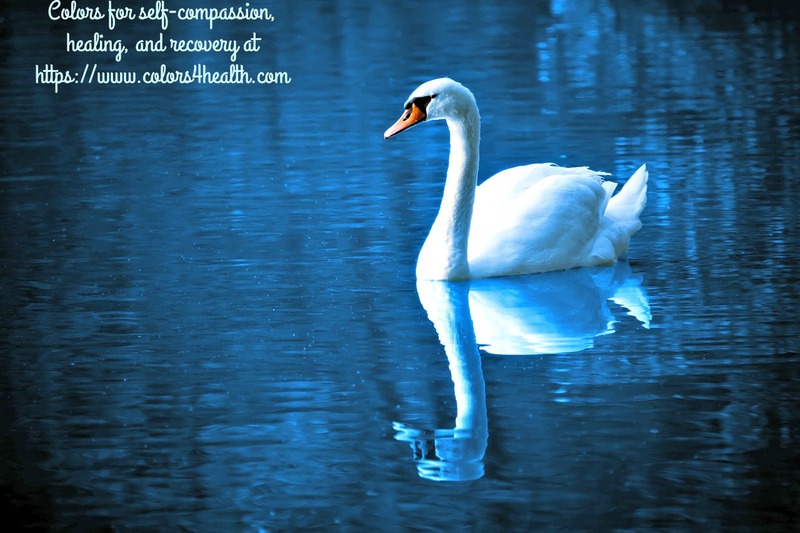 Here's tips to use blue to eliminate pain. RED. Develops energy, strength, motivation, confidence, will-power, courage, initiative, and focus. PINK. 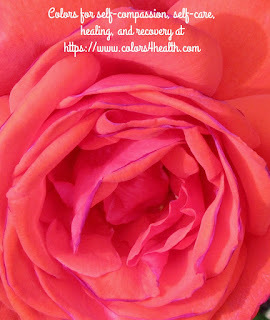 Soothe your mind, body, and spirit with a color associated with warm feelings, unconditional love, and gentleness. Pink is a mix of red and white combined, and provides a helpful balance of male and female energies that can reduce stress. ORANGE. Stimulates inner strength, creativity, self-expression, happiness, and puts a new slant on ideas and perspectives. Helpful to relieve depression, negativity, stress, bereavement, and loss. GREEN. Creates balance, harmony, personal development, self-acceptance, self-compassion, and rejuvenation. Works to lift anxiety, self-pity, and confusion and refresh you. GOLD. 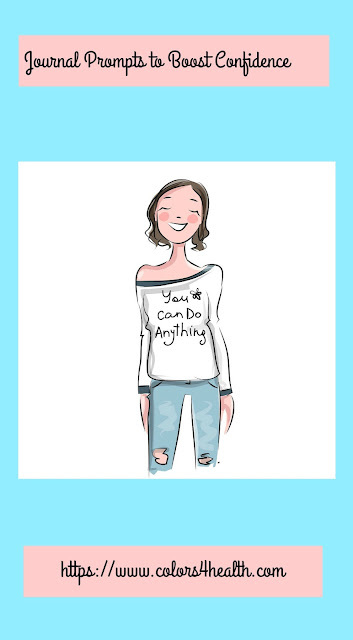 Encourages enthusiasm, balanced thoughts and feelings, and wisdom. 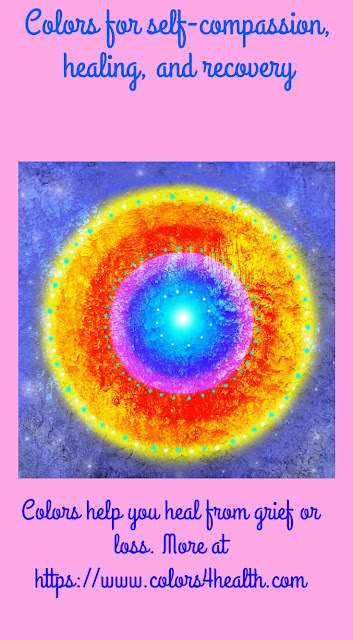 It's associated with higher ideals, generosity, and spiritual fulfillment. TURQUOISE. Reduces stress and fosters cleansing, healing, sharing, friendship, resilience, and tames anxiety and anger. PURPLE or VIOLET. Symbol of wisdom, dignity, royalty, and spiritual energy. If you seek completion, continuity, or a new beginning, place a purple drawing or representation of a mandala in your home meditation area. Gazing at these hues helps feelings flow freely and enables you to let go of the false illusion of control. YELLOW. Helps uplift, cleanse, and increases self-confidence. It works on self-control, ability to reason things out, and brings contentment. Yellow stimulates the mind and is healing for depression, despair, fatigue, negativity, sensitivity to criticism, lack of confidence. If you have trouble sleeping, avoid this color as it can produce insomnia or hyperactivity. Before you go, take a moment to comment. What things mentioned above resonate with you? 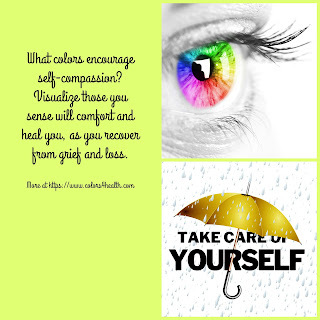 What colors comfort and support you as you travel over the rough patches of life? Please share any color insights you have, as they may help my readers and me. Be so kind as to not put links in your comments. I won't be able to publish your comment that way. 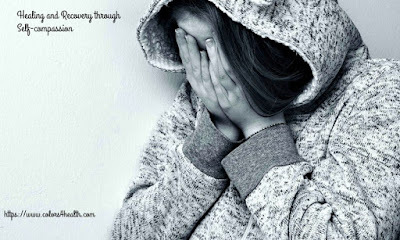 If this post has helped you or you sense it may help others, please pin it or reshare on your favorite social media outlet (with a link back to this post). Be so kind not to put links in your comment, as I won't be able to publish it. Why not follow me on Pinterest? I'd appreciate a Like my page on Facebook as well.